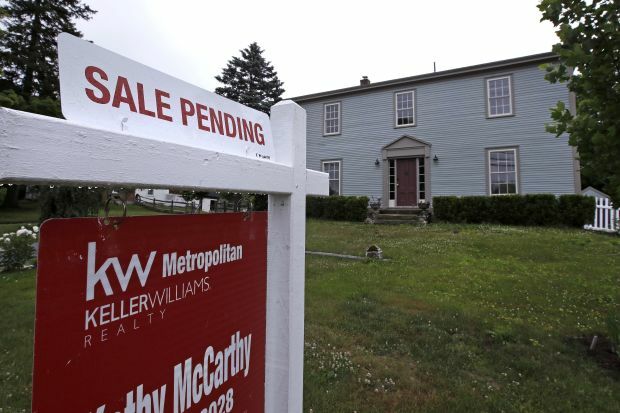 Home sales slumped in the second quarter despite what was likely the strongest period for U.S. growth in years, the latest sign that the economic expansion faces headwinds. Existing-home sales slipped 0.6% in June from the previous month to a seasonally adjusted annual rate of 5.38 million, the National Association of Realtors said Monday. Compared with a year earlier, sales in June declined 2.2%. Home sales have now declined on an annual basis in five of the first six months this year, a worrying trend since housing is considered a crucial indicator of overall economic health, economists say. By a number of measures, the economy looks to be accelerating after a long stretch of subpar growth. Economists are forecasting U.S. growth to exceed 4% for the second quarter when numbers are released on Friday. Jobless claims are falling, and corporate profit growth continues to looks strong. But weakness in the housing market could muddy the picture. Housing contributes about 15% to 18% of gross domestic product. Existing-home sales help drive other sectors of the economy. Consumer confidence and home-improvement spending, construction and mortgage lending tend to suffer when home sales slump. “The housing market led the general economy out of the recovery and now it’s leading” it toward a slowdown, said Zillow Senior Economist Aaron Terrazas. Mortgage-application volume decreased 2.5% in the week ending July 13, compared with a week earlier, including a 5% decline in purchase applications, according to an index put out by the Mortgage Bankers Association last week. New home construction, which is the major driver of housing-related employment, has also struggled lately. Housing starts declined 12.3% in June from the prior month, according to the Commerce Department. That was the largest monthly percentage drop in about a year and a half, driven by construction declines in all regions of the U.S. for almost all types of housing. Realtors say some buyers have grown weary of the run-up in prices, especially after mortgage rates increased. Brook Hogan, a real-estate agent in Portland, Ore., said she has seen signs that consumers are growing more cautious, especially at the higher end of the market. “It’s definitely slowing. Buyer confidence is a big deal,” she said. Jessica Aebersold, a 30-year-old who works at a company that rents photo booths, said she and her husband took three weeks to sell their Seattle-area home—in a town where multiple offers in a single weekend had been more the norm. Ms. Aebersold said she, too, expected the home to sell in the first weekend, but the day the house was listed, four others went up in the neighborhood. It took three weekends before they received a cash offer $30,000 below the asking price. Weakness in the housing market is the latest sign that a nine-year-old economic expansion faces challenges, such as the new tariffs that have increased the prospect of a trade war between the U.S. and China or Europe. The pace of growth and fears that trade tension could bring inflation have also raised expectations that the Federal Reserve will be more aggressive in raising interest rates. Traders in the federal-funds futures market now believe there is a near certainty that the Fed will raise short-term rates at least once more this year, and a better than 60% chance of two or more rate increases, according to CME Group. Any interest-rate increases could further depress home sales. “One of, if not the most, rate-sensitive sectors in the economy is housing,” said Torsten Slok, chief international economist at Deutsche Bank Securities. The average interest rate on a 30-year fixed-rate mortgage already has risen to 4.57% in June from 4.03% in January, according to Freddie Mac. By increasing the monthly cost of owning a home, higher mortgage rates force some buyers to seek out less expensive properties. They can push those at the bottom out of the market altogether. More notably, they may act as a disincentive for current owners, who enjoy historically low mortgage rates, to sell and lose that rate. While rising mortgage rates typically help slow price growth, the lack of inventory has meant that prices have continued growing much faster than wages and inflation, compounding affordability concerns. The median sale price for an existing home in June hit a new all-time high of $276,900, up 5.2% from a year earlier, according to NAR. The slowdown in sales was concentrated at the bottom end of the market, indicating that affordability concerns are a major contributor to the slow spring selling season. Sales of homes priced at $100,000 to $250,000 fell 7.1% in June, compared with a year earlier, while sales of homes between $750,000 and $1 million grew 6%, according to NAR. Strong price growth also indicates that there is still robust demand for homes, and that if inventory continues to increase, the market could regain momentum in the latter half of the year. Still, some 40% of home sales each year take place in the critical spring selling period of March through June. Even if sales pick up later in the year, they are unlikely to fully make up the lost ground. After a long stretch where economists have blamed a lack of inventory for this year’s lackluster housing-market performance, there are recent indications that the trend is beginning to reverse. But that suggests demand may be waning as buyers take longer to purchase, leaving properties on the market longer. There were 1.95 million existing homes available for sale last month, up 4.3% from the prior month and 0.5% from a year ago. That is the first yearly inventory increase since the middle of 2015, according to Lawrence Yun, the trade group’s chief economist.